You know in business as in life in general, adversity hits. We are all met with adversity from time to time, but how we handle it makes us or breaks us. As Ben Johnson once said, "He knows not his own strength that has not met adversity." So in saying, I thought this little story about how some friends' adversity changed them might shed some light on how you might handle the next hurdle you come across. Four friends went fishing. They found a perfect campsite in a pine grove next to a river that shimmered with promise. As fast as they could, they set up their big tent, stowed belongings, and set off eagerly down the river with their rods and reels. When they returned to their campsite a few hours later, tired but happy, they stood open-mouthed in disbelief. There was a big empty space where their tent had stood. It was gone! A quick search showed that everything else was still there -- stove, tools, food, sleeping bags, etc. Their stunned confusion soon changed to anger and a storm of questions: Why did someone take the tent and nothing else? Was a tent all the thief needed? Did they interrupt him so he couldn't finish the job? Or would he soon return for more? Fortunately, they still had their Coleman stove, frying pan, and eating utensils -- all the tools they needed to cook their fish and eat it. And they still had their sleeping bags against the chilly night air. Over dinner and late into the night, they sat around the campfire, debating the significance of the missing tent. At peace at last, they climbed into their sleeping bags, gazing up at stars instead of canvas. Being city people, they rarely got to see stars up close and personal. That night they slept more deeply than they had since they were babies. They had realized that life is inexplicable. 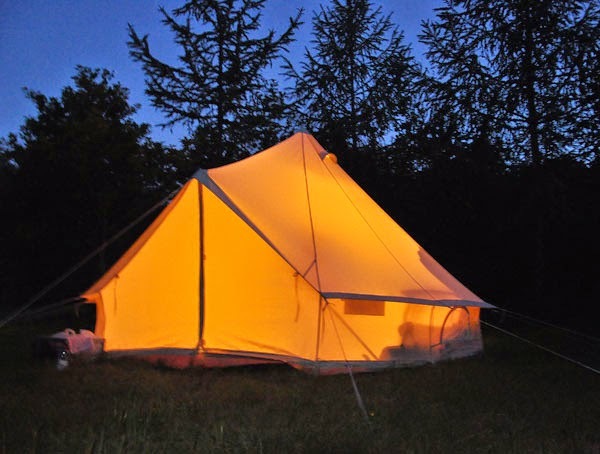 All of us have sudden changes in our life that are the equivalent of having the tent stolen from over our heads. We invest ourselves heavily in a project that fails. We lose a job, become ill or go through a life crisis. But as long as we still have the basics such as courage, faith, friendship, the ability to care and laugh and hope, we still have the tools we need for life. The thieves of life can't steal our enthusiasm and curiosity, our ability to care and love and be loved. We have to make a choice to give those up willingly. The moral: Someone will steal your tent every single time! Expect it, and be grateful that you still have the basics. Look up and enjoy the stars like the fishermen did. You may find new joys and opportunities that you never noticed before. In business, you will sometimes have your tent moved. How you react will ultimately determine your success or failure. Thanks for this encouraging word. Adversity does put life in perspective. I learned that from Katie's bouts with cancer. Last week her oncologist told us that it is unlikely she will have a recurrence since she has and for including my book in your list of recommended readings. I appreciate it. Thanks Mike for the comment. Anything to add a little encouragement!